For those who have little time and who wish to be closer to the nature, the Panchase trek is one of the best options to discover Pokhara and its surroundings, as well as the culture and the way of life of the local community. Panchase lake, famous for its religious pilgrimage and the various sacred sites in the area, is located in this region. The area supplies water to Fewa lake. 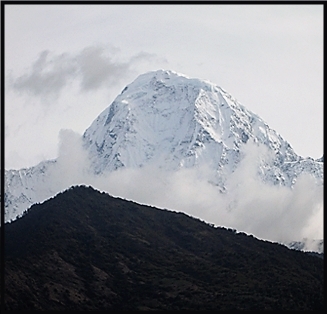 From here, you will have a first-rate view on different summits: Annapurna, Macchapuchre, Lamjung, etc. Photography’s lovers will enjoy breathtaking panoramas. People in good physical condition can easily make this trek which, compared to other roads, requires less time, explaining why the region is gaining popularity among travellers. Arrival and transfer to the hotel to meet the trekking team. Kathmandu sightseeing (UNESCO world heritage sites). Drive to Pokhara (885 m, 6hrs) and sightseeing. Boat across Fewa lake (45 min), trek to Bhumdi via World peace pagoda (1520m, 5 hrs). Bhumdi to Panchase Bhanjyang (2030m, 4:30 hrs). Hike up to Panchase Hill (2515 m) and discovering of Panchase village. Panchase Bhanjyang to Bhadaure (1650m, 4 hrs). Bhadaure to Naudanda (1515m, 2:30 hrs). Drive back to Pokhara (885 m, 1 hr). Drive back to Kathmandu (6 hrs). Starting from 400 US$ per person.